A part of the Huong river is clean and tidy, from down the water up to the grassy bank, thanks to the effort of its “guardians”. A weekend afternoon, just like any other afternoons in the past two years, no matter whether it’s sunny or rainy, a group of women in Kim Long ward, Hue city gather to the river bank to pick up trash. For them, that silent job is considered a mission: Protect the river! arbage such as plastic bags, votive paper, plastic packaging, or water fern were floating on the water before being picked up and dragged ashore by these women with their soft hands. “We go out here every afternoon to watch the river. And it hurts to see this. If we don’t take action, whom should we turn to?”. These women, old or young, share a sincere love for the romantic river. In a chilly afternoon in late spring with light sunshine and a clear sky, as the dragon boats carrying tourists back to the city, Ms. Dan, Ms. Huong, Ms. Lan and the others with racquets, clips, gloves and trash bags in their hands, headed to the park on the Huong river’s bank at the crossroad of Kim Long street - Nguyen Hoang street - Nguyen Phuc Nguyen street, to do their familiar job: Trash picking! Trash of all kinds, from votive paper, plastic bags, water fern, is picked up from the Huong river. The Huong river is poetic and breathtakingly beautiful. Inexplicably, this part of the river becomes dreamlike and shimmering at twilight. Taking a deep breath, the women pulled out the gears from their “toolboxes” and helped each other put on gloves before dispersing, each to a different area, to pick up trash, from the grassy bank down to the water. Garbage is put into large bags, pulled to a predetermined place before being taken to treatment areas. Struggling to drag masses of paper offerings thick with paper clothes, votive paper, water lanterns, etc., that people had dropped into the river from the previous night, Ms. Truong Thi Dan, 58 years old - the oldest in the group, couldn’t help feeling sad. These lumps of trash, when pulled ashore, were still intact because they had been wrapped up in plastic bags. “I wonder if people feel anything when dumping trash into the Huong river. They pray for themselves, but do they think that doing so is also a crime because it harms the environment, natural life and the people who use the water?”, complained Ms. Dan. Ms. Dan, a demobilized military woman, looks like a bodyguard. She protects the Huong river against the heartlessness of many people. Minding something not her business, she nonetheless always receives great support and sympathy from her husband and children. That urges the woman with a Thanh Hoa accent to become more determined to do her bit in protecting the ancient imperial capital’s green lungs. As sundown approached, along the river bank, towards the upstream, garbage was ubiquitous. No words heard among them, the women focused only on picking up trash. Some masses of trash were so heavy that they sunk down to the bottom of the river, leaving the collectors no alternative but to dive into the water to drag them up by their hands. In the conversation with us, many times the women referred to the journal “Who named the river” by Hoang Phu Ngoc Tuong. For them, the Huong river is always enchantingly, gently and passionately beautiful. That’s the reason why they can’t stand in indifference and watch their beloved river being harmed every day. As the days go by and I have followed the group closely to their work, I get to see in them a deep attachment to the river that not all people have. Without a word of complaint or resentment, picking up trash for them is like fulfilling their duty towards gentle mother nature. One of the young girls in the group of trash collectors is Huong Lan, who has inspired many people. 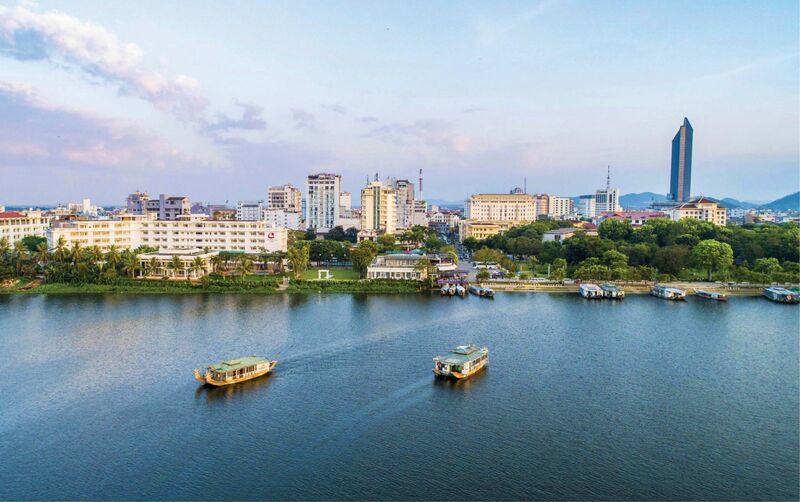 The image of a young girl in her early thirties who every afternoon gathers with other women in her neighborhood to the Huong river to bathe and pick up trash has become familiar to many people. 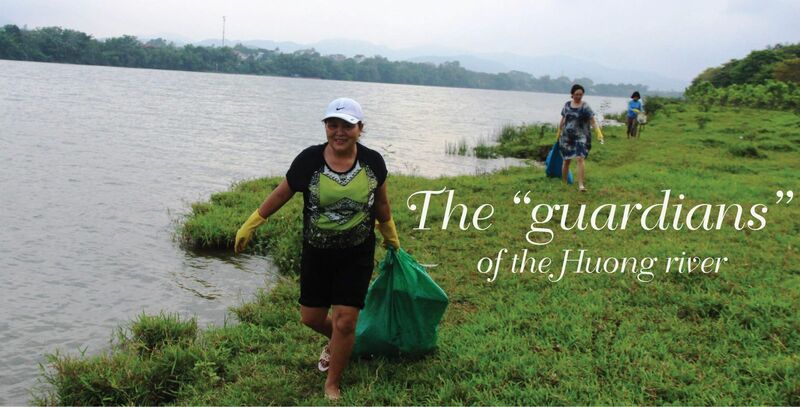 Few know that Huong Lan is one of the initiators of the “Thanks to the Huong river” group - calling for the collection of garbage to protect the Huong river, which she often refers to as “the gentle mother”. 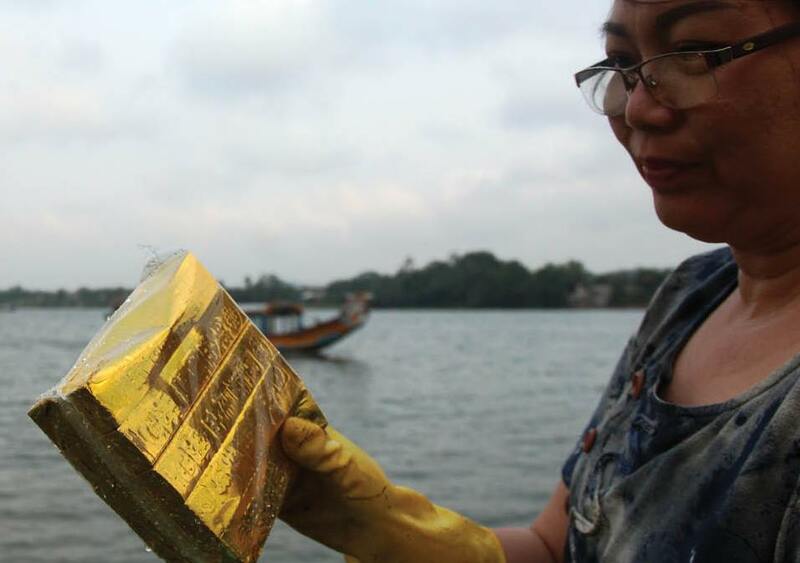 Having guided foreign tourists on countless sightseeing boat trips back and forth on the Huong river, it was as so many times that Huong Lan had been startled by visitors' question: “The Huong river is so beautiful, but why is it so full of trash?” That question haunted her, urging Huong Lan to initiate such a serious and methodical campaign. Although busy with her tour guide job, Huong Lan still dedicates some of her time to sit by the river, share with other members in the group stories about protecting the environment and the experiences she earned from picking up trash in many places. “Thanks to Huong Lan, we know a lot about protecting nature, water resources and, furthermore, the river flowing through this city,”, Ms. Le Thi Thanh Huong (51 years old) – a regular trash collector added. Ms. Huong recalled those first days collecting garbage, when many people thought of what she did as pointless and ostentatious. However, ‘still water runs deep’; after understanding their silent work, many people asked to join. As the group got bigger, there were not enough tools for everyone. Huong Lan used her own money and asked for donation from her friends to buy more tools for picking up trash. She received her friends’ support immediately. The clean and clear Huong river, a must-see destination of Hue, needs everyone’s protection. Not only picking up trash from the water, this group also classify it. Organic waste is separated, to be used as fertilizers for trees. Thanks to Huong Lan’s perseverance, as well as many others’, no trash is found at this part of the river where she goes out to bathe every day. The Huong river is once again pure, clean and beautiful.